← Why Carve the Train into the Gravestone? The death of animal trainer, John King, is a tragedy that was recounted in many different places. In the book, It Happened in North Carolina, by Scott Kent, the elephant Chief became murderous because of surging levels of testosterone which increase dramatically in the male elephant once a year in a period called musth. “Our elephant trainer was a young man named King, thoroughly up to his business and acquainted with all wild animals as few men ever get to be. King loved his charges, and his charges loved him, that is all of them but Chief, and as for Mary, she was just crazy about the man, and would trumpet with delight whenever she saw him approaching. “Mary was far bigger than Chief, and her weight and power gave her the right to shine in the role of the wife who wears the trousers, but for all Mary’s Amazonian tendencies she was not a flirt, and gave Chief no cause for jealousy. But Chief early took a dislike to King, the trainer, for no other reason, I believe, than that Mary showed great affection for the man, and there were times that if King ever came near Chief the elephant would give unmistakable signs of anger and a dangerous gleam would show in his mean little eyes. “Once Chief lashed out at King with his trunk when the trainer was sweeping Mary’s sides with a broom, and the swing of the blow just missed the man. King jumped to one side, and as he did so Mary, with a bellow of rage, smashed the smaller elephant a blow on the head with her trunk that brought Chief to his knees. Mary was ready for a charge, her big head lowered to serve as a battering—ram, and Chief would have fared badly that had not King acted promptly. He knew that he could trust Mary. And, springing in front of the big beast, extended both his arms, and cried: ‘Get back, girl: there now!’ His order was obeyed, and Mary, wheeling around, went off quietly to her place, and so a panic in the elephant house was averted. “Our show was in North Carolina, near Charlotte, when the grim tragedy I am going to tell you of happened. We had been playing a number of little towns with some success, and instead of traveling on the railroads, used our elephants and horses to move the animals and tent wagons from place to place over the hard country roads. “Mary at this game was of more service to us than a dozen horses or an army of men. She would lead the elephants up and they were all too much afraid of that ever-steady trunk of hers not to follow when she trumpeted the command, and the hulking beasts would shove wagons out of ruts, carry tent poles in their trunks, or do any other manual labor we had for them. “Chief had been acting very mean, and it was up to Mary to punish him several times before we reached Charlotte, but for all the chastisement he received from his massive wife, the elephant seemed bent on mischief. Indeed, as we afterward found out, the blather was showing on his right temple. “Let me explain myself, as perhaps few of you are familiar enough with elephants to know what I mean by the blister. Elephants—that is, some elephants, and Chief was included in that class—have periods of madness, but nature has provided the means by which man may anticipate that period, and put the beasts in restraint. The periods are more violent in some elephants than in others, and while in one the mood might reach complete madness, in the majority it only assumes the proportions of marked ill-temper and surliness. You’ve often seen elephants in the circus chained by the leg to a heavy peg, no doubt? Well, they are the surly ones; the keepers tell you they are mankillers, naturally vicious and such rot; that’s only stock talk; the blister has shown on the animals, and they are kept in temporary restraint until the crazy period passes. A week or two before the elephant enters the mean state a swelling, hardly larger than a silver quarter, forms on his temple. The swelling gradually increases in size of a large hickory nut. The experienced showman has the elephant chained by the leg or well hobbled with chains, if the outfit is moving, the minute the swelling shows. Now, after all this explanation, which is perhaps dry enough, let me get back to my story. The blister was on Chief’s right temple when our show pulled into Charlotte for a one-night stand, but King had not noticed the swelling, so he was off his guard. Chief cut up badly when the Hindoos came to put his howdah on for the grand march, and even when Mary was walked up to bring him to account, he showed a disposition to still be unruly, and appeared willing to fight the queen of the herd. His temper was such that he was left out in the animal tent, only Mary and the other elephants—six in number went on in the entry. “The show passed without incident, and as we could not move over the roads in the dark, we waited until daylight to break camp. With the first light of day, the canvas was down, folded, and on the wagons; the poles were lying piled, and the horses were being harnessed to the cages. King got his elephants in marching order, and followed in the wake of the moving vans, and all went well until the heavy cage in which were confined the four lions stuck fast in the muddy road, a short distance from town. The six horses drawing the cage strained and pulled to no purpose, and as a last resort King was called up and asked to bring one of his elephants. “King went away and returned in a few minutes with Mary and Chief. Whatever possessed him to bring that mean bull elephant I don’t know; his choice, poor fellow, cost him his life. King spoke to Chief and ordered him forward, and the elephant obeyed, although unwillingly, and as he stepped into the mud, he swung his trunk dangerously from side to side. No amount of prodding with the driver’s hook would prevail on Chief to put his head to the cage, and King, thinking the elephant was frightened or disconcerted by the rumbling roars which came from the imprisoned lions, stepped into the mud and leaned against the van, and made as though shoving. “Chief’s time had come; he saw the one great chance to fill his cup of vengeance, and turning suddenly strike the cage. The elephant’s bulk crushed into King and jammed him against the cage, and the great beast, throwing all his weight into the effort, smashed that unfortunate trainer as flat as a pancake—pardon the term, but it is the only fitting one I can find. Every bone in King’s body was crushed into a bloody pulp, with what few features that were distinguishable flattened out and twisted as though a stone grinder had passed over them. “With the act of murder the mad mood claimed Chief entirely, and throwing his great trunk into the air and trumpeting shrilly he dashed wildly down the road, overturning several horses that were in his way. John King lingered through the night of the tragedy and died at 11:00 the next morning on September 28th. He was promptly buried that same afternoon. A hearse carried his body drawn by four white circus horses. Mary and the Boy followed his casket. 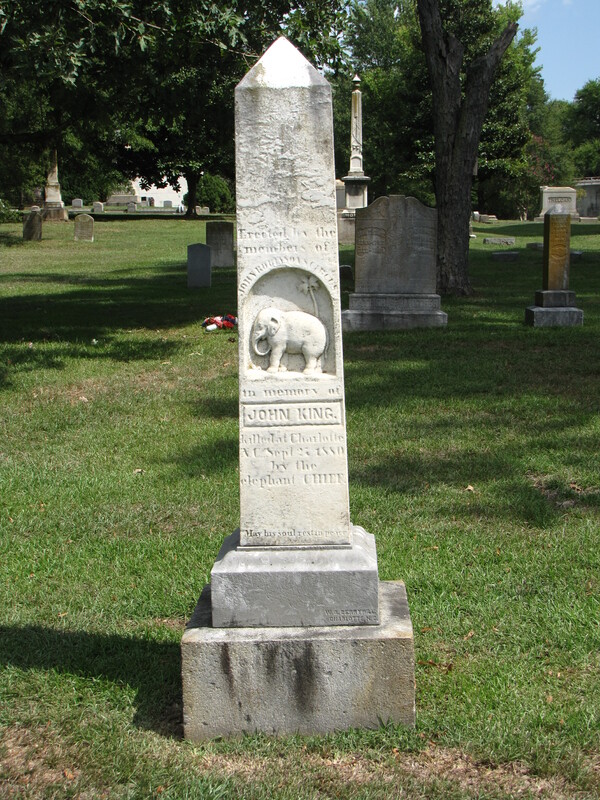 John King was buried in the Elmwood Cemetery at Charlotte, North Carolina, beneath a five-foot monument donated by his fellow circus workers. 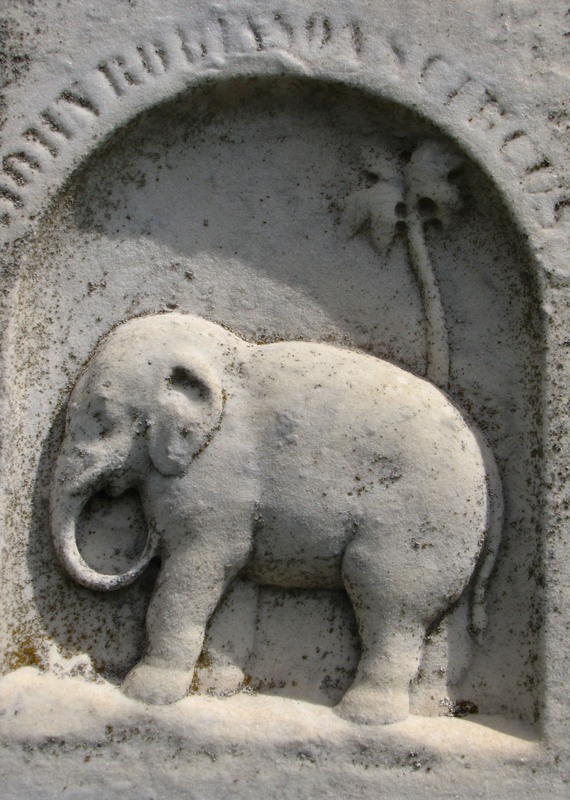 On it is carved the image of an elephant and a palm tree carved by the Confederate veteran Billy Berryhill. But, that was not the end of the story for the now infamous elephant named Chief. The circus masters decided that Chief was too much for them to handle, so they shipped him to Cincinnati to the Zoological Gardens. Chief remained rogue and reportedly killed two more trainers before he met his fate and was killed. And that still was not the last of Chief. 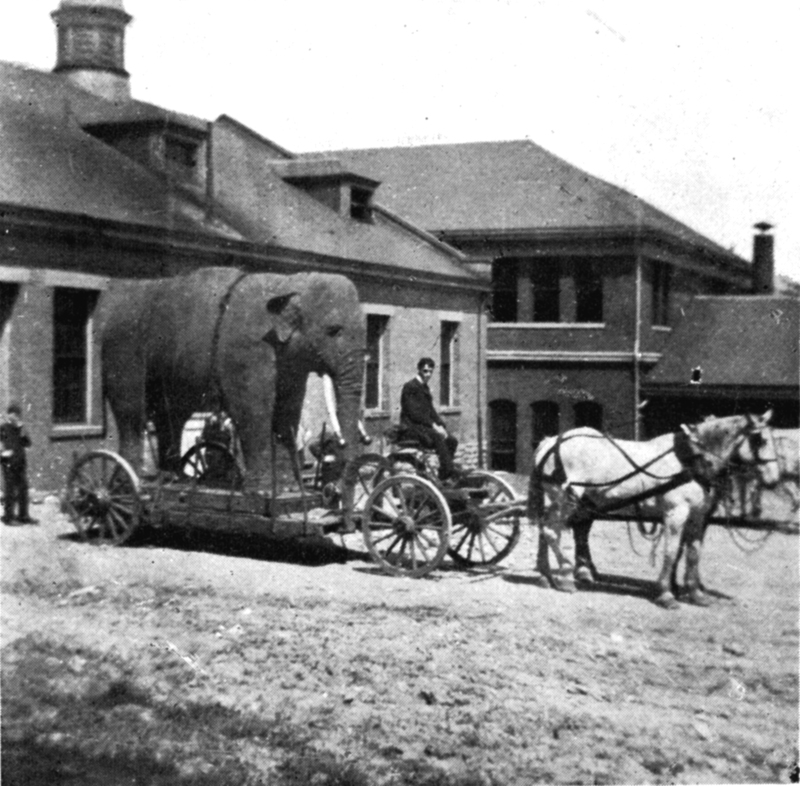 According to the University of Cincinnati magazine, “Certainly you would have thought your eyes were deceiving you, but a full-size stuffed elephant was, indeed, transported on a horse-drawn cart outside the UC gymnasium in 1902. More surprising, the pachyderm lived on campus until 1998. Old Chief, a five-ton Asian elephant, was imported to the U.S. in 1872 and performed with the Cincinnati-based Robinson Circus until his demise in 1890. His remains were stuffed and displayed at the Cincinnati Zoo for a decade or so until making the trip to UC. I never cease to learn something new from every post you write! Wow! Interesting information! Wonderful story! So you know whatever happened to Mary? According to the Washington Post article of Sunday, March 3, 1907, Mary died of a broken heart. The article says that she was 92 years old when she died. She evidently pined away for Chief and King.